A package of 10 pcs. costs 615 USD. 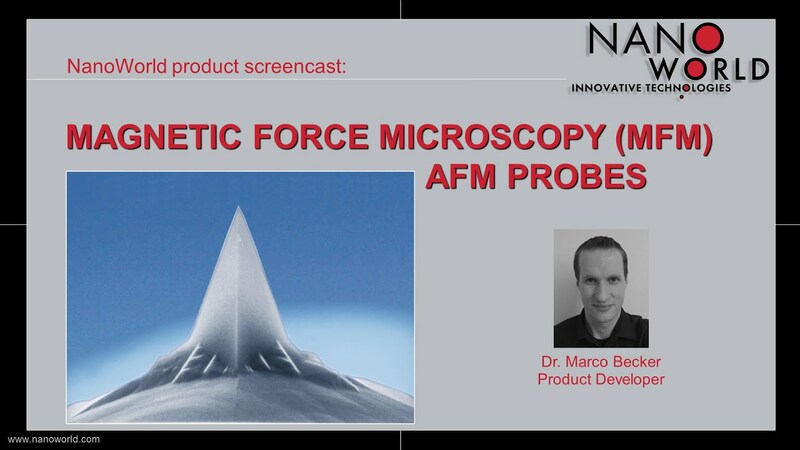 NanoWorld Pointprobe® S-MFMR AFM probes are designed for the measurement of magnetic domains in soft magnetic samples. Due to the low coercivity of the soft magnetic tip coating the magnetisation of the tip will easily get reoriented by hard magnetic samples. All SPM and AFM probes of the Pointprobe® series are made from monolithic silicon which is highly doped to dissipate static charge. The tip is shaped like a polygon based pyramid. The soft magnetic coating consists of a thin soft magnetic layer deposited on the tip side of the cantilever. The coercivity is app. 0.75 Oe and the remanence magnetization is app. 225 emu/cm3 (these values were determined on a flat surface). We recommend magnetizing the tip by means of a strong magnet (e.g. a NdFeB magnet, a few millimeters in size) prior to the measurement. The aluminum reflex coating deposited on the detector side of the cantilever enhances the reflectance of the laser beam and prevents light from interfering within the cantilever. As the coating is almost stress-free the bending of the cantilever due to stress is less than 2 degrees.